RMI knows that image is everything in today’s economy. When the general public thinks about manufacturing, we know that the image they have is not always positive. Many impressions from the media have been about the smokestack industry or labor intensive work that harkens to years gone by. These stereotypes are off-track and do a disservice to those working in today’s Maryland manufacturing and are an inaccurate reading of its importance to our State. RMI has ramped up its game to help promote the image of Maryland Manufacturing. Hear about our new initiative with Maryland Public Television (MPT) to tell the story of why Maryland Manufacturing Matters. Enjoy a fantastic night of networking with the RMI Board of Directors and other leaders of business, government, education and the non-profit sectors. Learn more about this event. The real manufacturing occurring in Maryland has little to do with the so often heard negative stereotypes of our industry. In fact, manufacturing is at the heart of innovation for our economy. Manufacturing encompasses many of today’s trendy areas of interest, particularly computer software technology and robotics. While manufacturing doesn’t employee as many workers today, it is cleaner than ever, it requires more advanced skills and is more productive than ever. Policymakers need to also recognize that manufacturing is increasingly intertwined with the services sector. According to a recent McKinsey & Company report, every dollar of manufacturing output requires 19 cents of services. And in some manufacturing industries, more than half of all employees work in service roles, such as R&D engineers and office-support staff. If manufacturing is not valued by the public, then it’s easy for policy makers to enact legislation that can harm the industry. RMI has seen this occur many times over the years. Additionally, if manufacturing is not valued by the public, then many parents will steer their children towards more “hot sectors” of the economy making it increasingly difficult to find the workers required for today’s ever-increasing high tech manufacturing. RMI’s image campaign helps put a face on manufacturing. We want policy makers to better understand what is being made in their jurisdictions, how many are being employed and how those products are helping us in our daily lives. We want policy makers to see the good work that manufacturers are doing in their communities. We want kids to see manufacturing as fun and a great career challenge. Recognizing the Champions of Maryland Manufacturing is a key element of RMI’s image campaign to help put a face on today’s manufacturing. By helping to tell the stories of those that are championing the manufacturing effort in Maryland, we help policymakers better understand the products made in their jurisdictions and how those goods help us in our daily lives. We also help educators, parents, and kids see manufacturing as a viable, enriching career opportunity. 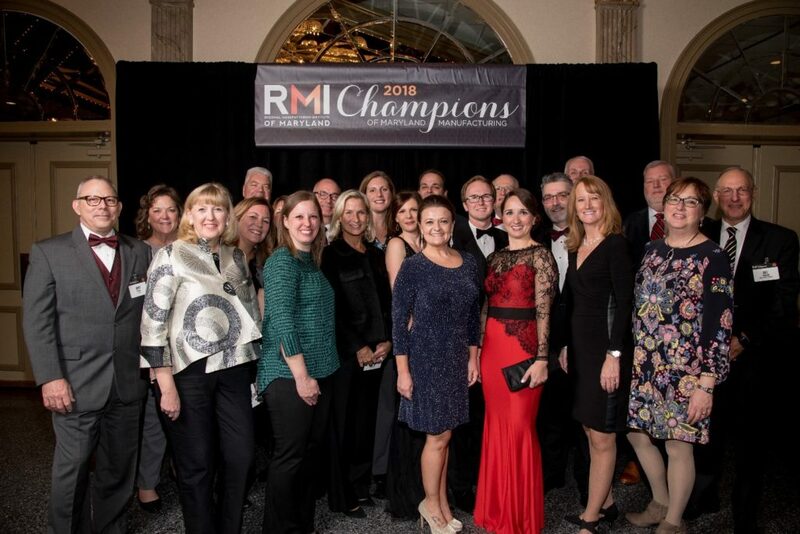 During 2018, RMI received 280 nominations for Champions and selected the top five from each nomination category. The Champions awards ceremony drew over 600 stakeholders from around the State. The top five 2018 Champions of Maryland Manufacturing in each of the following nomination categories: Community Engagement, Emerging Leaders, Energy & Sustainability, Growth & Productivity, International Business, Manufacturing Technology (Industry 4.0), STEM Student Advocate and Talent Attraction. The evening awards program touched on the themes of togetherness and family as we celebrated a variety of different leaders from young students to business executives. 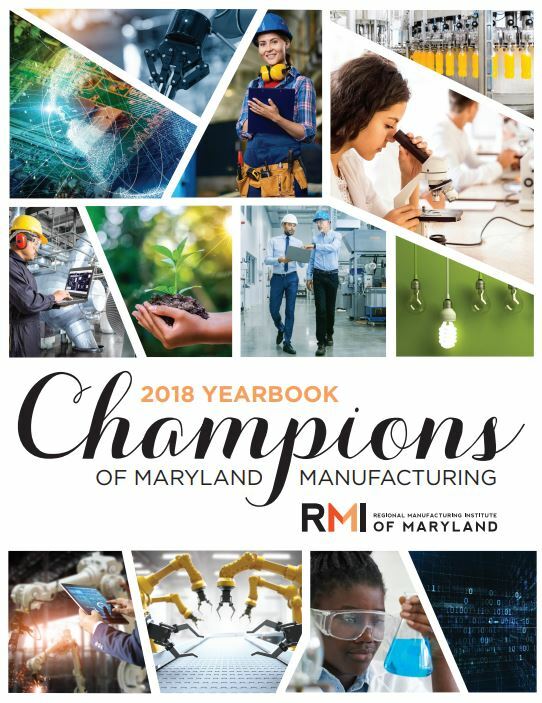 Champions received their awards and saw their Champions features in the newly published 2018 Champions of Maryland Manufacturing Yearbook. If you are interested in helping RMI continue to promote the image of Maryland manufacturing, please give us a call today at 443-275.2489 or email peter.gourlay@rmiofmaryland.com.